I have just returned from a road trip through Kogi, Plateau, Bauchi, Gombe, and Adamawa states to conduct research for my new book, The Party’s Over: Transition, Terrorism, and Turnover in Nigeria’s Fourth Republic. I met with the former Vice President, rural cattle herders, local chiefs, the Emir of Bauchi, bureaucrats, displaced persons, scholars, political party officials and civil society activists. Here are some of my preliminary reactions along with some of the questions posed by my field notes. 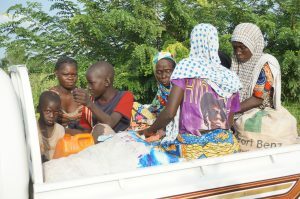 Displaced persons from Yobe, who have been living in an informal “host community” in Gombe State for two years. They have never been visited by any government officials. The millions of Internally Displaced Persons (IDPs) in the northeast are becoming an institutionalized humanitarian crisis. Government officials have different interests with regard to the IDPs, and the government and community responses to IDPs vary from state to state. According to a variety of Nigerian government and non-governmental sources, some emergency management officials and local governments see humanitarian assistance (especially foreign aid) as an economic boon that arrived just in time to cushion the shock of the country’s deep recession. By contrast, some state governments, such as Adamawa’s, would like to send the IDPs home. With 270,000 IDPs around the city of Yola alone, according to an enumeration conducted by the American University of Nigeria, we are talking about large numbers of people who could become a drain on state resources and the current local goodwill. Not only is this a recipe for an ineffective response to one of the world’s greatest humanitarian crises, absent much stronger and more coherent coordination it is also a recipe for corruption. According to one example provided (not yet verified), Borno’s State Emergency Management Agency counts more camps around Maiduguri than the United Nations does; the camps transcend Local Government Area borders so officials see this as an opportunity to inflate aid demands. The humanitarian crisis outside Maiduguri requires urgent attention, and the assistance within Maiduguri begs for more scrutiny. Displaced children living in Gombe. It’s good to see more reporting coming out of Maiduguri, once the center of Boko Haram’s violence in Borno State. But news stories coming out of Dalori and other areas would benefit from shift from human interest to governance. Allegations of wastefulness by donors and corruption by government officials need to be investigated. Much of the humanitarian corruption is also intertwined with military malfeasance. We spoke with the family of a colonel who refused to falsify weapons procurement contracts and was sent to the front lines, where he was shot by Boko Haram. Positive stories about clever innovations and solutions for efficient allocation also need to be highlighted – and verified if they come from official sources. This is difficult to do with the limited access that Nigerian journalists have had to budgets, planning, and much of the northeast. Any reconstruction plan for the northeast needs transparency and democratic input commensurate with the scale of the spending. The plan that exists, prepared by the Presidential Committee on the North East Initiatives, has not been widely shared and is stalled within the cabinet, according to sources in Abuja. (Click here to read the executive summary.) Funding and a coherent implementation strategy, with oversight, are essential both for the livelihood of the displaced and to maintain long term harmony in states that hope to send their visitors home someday. Returning from the fields – ethnic groups that traditionally avoid settled agriculture are planting crops in South Yola. Those who refuse to return (“I am never going back to Maiduguri,” an old man told me in the forest in South Yola) will eventually face discrimination unless federal citizenship laws concerning indigeneity are resolved. 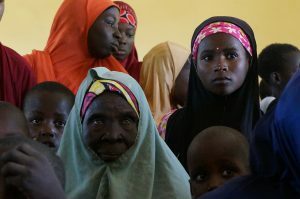 The IDPs who stay – Muslim Fulani who are now planting farms in Adamawa – risk becoming unwelcome “strangers,” with possible comparisons to settler communities in northern Jos that have been conflict flash points. The legal status of IDPs in host communities is also important because it could potentially lead to a perpetual state of political disenfranchisement. In both Gombe and Adamawa, IDPs said that their vote “did not count” or they were unable to vote through the temporary voter registration mechanism established by the Independent National Electoral Commission. When asked what they wanted to “teach” the government, most said they will not vote again at all. This disillusionment is the first step down a road to deeper feelings and acts of resentment and alienation. 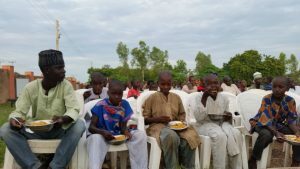 Displaced children and almajiris in Yola. Many analyses argue they provide fertile recruits for Boko Haram, while some studies question that evidence (see Hannah Hoechner 2014). This entry was posted in . on September 28, 2016 by Dr. Carl. Current story in Nigeria is that over N5 billion already released to alleviate the suffering of internally displaced Nigerians in the NE have been diverted under the nose of the current administration noted for anti-corruption. Even as the people continue to die day by day of hunger and disease in the squalid IDP camps of the NE, some Nigerians continue to steal the money meant to feed and cure them. Most corrupt persons know that Muhammadu Buhari, Nigeria’s president and gritty anti-corruption czar, cannot be everywhere, every time. That’s why his war against corruption is being derailed in the NE where fictitious contracts and other forms of stealing reign with impunity even as the victims, the IDPs, remain absolutely destitute. Plus ça change! You are right, more transparency is need. It is needed to ensure that your claim that the IDPs can constitute a drain on state resources is appropriately delineated. Into what bowl, for example, are the resources being drained? The state governments will say “many increasing IDP stomachs”; some people will say, “many corrupt pockets” — and both will be right. Nigeria is yet to realize the magnitude of the current crisis and what it portends for stability in the region and nation-hood as a whole. The real issues will stare us in the face when the donors leave the scene.